Portuguese Chocolate salami is Not really salami, but gorgeous little logs of chocolate studded with biscuits and more. You will be amazed first by how much these look like salami, then by how delicious this chocolate confection is. This recipe makes three salamis, perfect to give some as food gifts or keep in the freezer for unexpected guests. 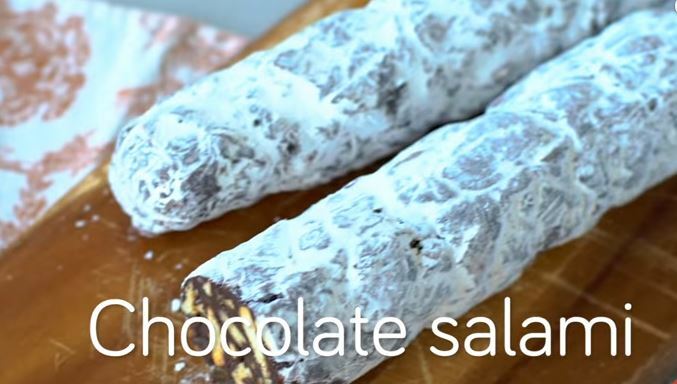 Chocolate salami is a very easy ‘no-bake’ dessert. Get creative with this grown-up, rocky road chocolate biscuit bar – then roll into a sausage. It also makes a great DIY gift to offer friends or family during the holiday season. The salami log can be kept in the fridge for up to 1 week and brought out as needed, cut into slices, and served either as dessert after a meal, or on a tray alongside other holiday cookies. The first time I saw a slice of chocolate salami, my heart skipped a beat. Imagine the consistency and richness of a chocolate truffle,with crunch cookies and nuts. Ingredients : Buttery biscuits ( any type ) – 250 gr or 2 cups Milk – 75 ml OR 1/4 cup Unsalted Butter – 100 gr OR 1/2 cup 3 tbsp of sugar 1/2 cup OR handful of walnuts Cocoa powder – 3tbsp. 1. Break the biscuits (cookies) into small pieces into a large bowl. 2. 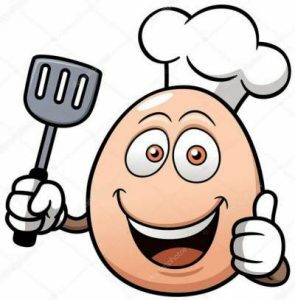 Heat a non-stick pan over medium high heat and toast walnuts or hazelnuts for about 5 minutes, stirring frequently to toast evenly. Add toasted nuts over the biscuits. 3. Prepare the chocolate syrup. In a medium sauce pan add sugar and cocoa powder. Stir to combine and gradually add water, while stirring to combine well. Add the butter and place over medium heat. Bring to boil for about 7-8 minutes stirring constantly. Remove from heat and add vanilla extract. Set aside to cool slightly for about 10-15 minutes. 4. Pour the syrup over the biscuits and nuts and combine well using a large spatula or spoon. 5. Transfer the mixture into a 9 inch (23 cm) non-stick round cake ware (like the one I’ve used from Delicake) or use a 9 inch (23 cm) springform pan, bottom lined with parchment paper. 6. Press well using the back of the spoon or an offset spatula. 7. Cover and refrigerate for about 30 minutes to 1 hr before preparing the chocolate ganache. 8. Prepare Chocolate Ganache. Place cream into a small saucepan and heat until just begins to boil. 9. Pour hot cream over the chopped chocolate and let sit for 1 minute. Stir until smooth. 10. Pour ganache over the chocolate biscuit cake and refrigerate to set for about 3-4 hours or overnight before serving. 11. Decorate with toasted nuts if desired, cut into slices and serve. Spain info Cooking Spanish style, Chocolate-Salami, San Francisco De Asis, Urb Marina, San Fulgencio, 03177, Alicante, Spain.